(Sarah Grohnert, NZ 2015) - Exempt 90 mins. 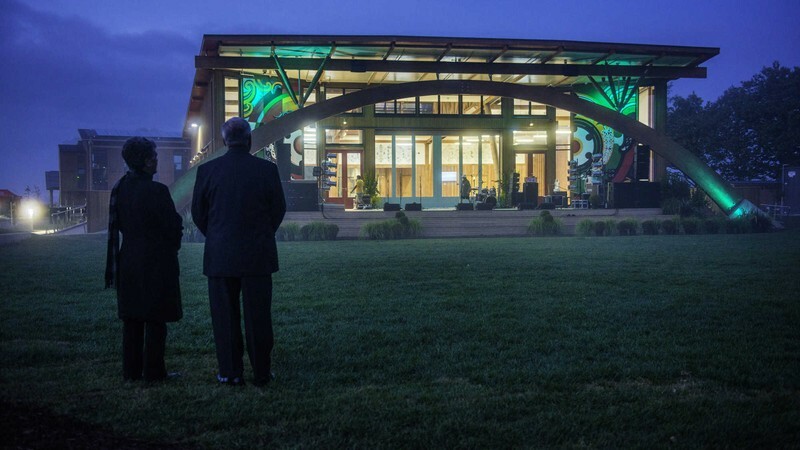 "Ostensibly a film about the construction of the first ever "Living Building" in NZ, conceived as a testament to the values of the Tuhoe people and their vision forself-governance, Ever the Land was this and a whole more. The film begins with a narration that declares that the war between the fiercely independent Tuhoe and the crown to be a stalemate and though there be some who would wish the fight to continue, there are others who sense it is time to close the door on the past and open a new door to the future. The film ends with a moving apology from the crown for all the wrongs the Tuhoe people have been subjected to since colonisation. In between is a subtly drawn portrait of a people moving forward into the future, embracing modernity and the spirit of forgiveness. A beautifully constructed piece of observational cinema, it was a profound experience that deeply affected both my heart and mind. A testament to all the people of this special little nation, I left the cinema a little bit wiser and with a sense that I had been witness to something very special." - Andrew Johnstone, Rip It Up, 18 July 2015. Preceded by compilation shorts from National Archives 9 mins.